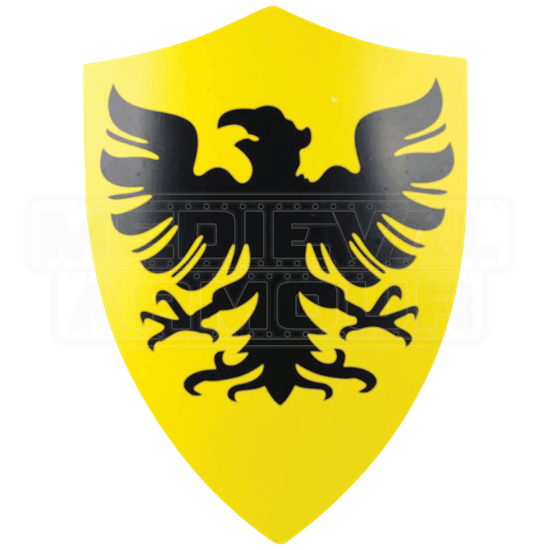 The Germanic Eagle Medieval Shield is emblazoned with the eagle as its main charge, displaying a symbol often linked to the history of Germany. This stainless steel shield is made in the style of a classic medieval heater shield. A yellow field decorates this particular shield, which features a graphic of a black eagle with its wings and legs spread out. The stylized shape of the shield features a point at the top and curved edges that draw the shields base down into a point. This shield is sure to catch the eye of those who see it, whether you have it on display at your home or it is on your arm at your next medieval event.